Hello, my name is Elena Melnikova. deep knowledge of selection and genetics, anatomy and physiology during a six-year studying Lublin in Poland at Agricultural Academy. I’ve been a member of The Belarusian society of hunters and fishers since 2001г. The expert on breeds and tests of pointers since 1999г. In 2006 I received a rank of the Honorary member of Polish German pointers’ club. 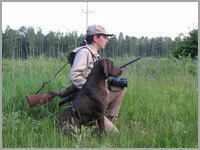 I hope to apply my knowledge and to be useful in development of German pointers in Belarus.